Information and communication technologies should never neglect traditional methods of teaching, its main aim must be to create conditions that will contribute and develop processes of interaction between students , the teacher and the information. Consequently this cognitive activity, should be provided to certain environmental components corresponding to the subject matter of the course contents. The article deals with the changes that are going on in our country in the direction of IT, followed by the establishment of modern technologies in the learning and teaching processes. Effective use of the computer requires a certain style of thinking, special skills, that becomes one of the vital things happening in the process of gaining intelligence and skills formation for secondary school students. It makes teaching and learning processes more varied and interesting. Subject importance- Information technological resources plays a significant role in the protection improvement of teaching, scientific and methodological level of international educational standards. IT use of a methodological basis should be created for the study of the educational space. Learning new ways and methods should be essential for the newly qualified teachers that is relevant to the overall educational standards. This road runs through the new techniques. Student Portfolio will be created in the form of an e-magazine, web pages for the parents, which will be dedicated to the problems of training materials and family life, school web sites should connect students, teachers, parents-asking and answering the questions. Web page contains wording as well as video and photo materials. resources can cause interest of pupils, parents that can create conditions for increasing quality of education level. The importance of the usage of information technology. The aim — We did a research on readiness of school teachers to include the IT in their teaching process actively, how the process is generally going on, what are the main difficulties and what possible solutions are there to minimize the problems occurred. The subject-informational technologies in the educational process. we conducted the survey in Ajara secondary schools in order to identify: How skilled they can use information technology in teaching process, if they have their own computers and access to Internet. We determined whether they have ability and need of any trainings in basic computer skills in order to improve, we have found that they need to involve them in the training of information technology teaching; The students were also interviewed. In addition the lessons were observed both in the primary and high school. What resources are there in school (computers, Internet, office, staff)? What is the rate of usage of computer technology? Do you have a practice of e-books? The survey was carried out in March 2016 — June in secondary schools, including 10 high schools in the district. In total, 200 teachers were questioned. 30 modernized lessons were observed, questionnaires were distributed to 100 teachers, 100 teachers were inquired through internet technology, but in the end, only 76 filled in questionnaires out of 100 turned out to be fit for statistics. 100 surveyed through technology is quite suitable. During the survey respondents were quite open, and we received the information we needed to full extent. 1.. What resources are there in school? (computers, Internet, office, trained staff)? 3.The majority of teachers (38%) say that they have a pretty good command of MS Word. survey and questionnaires show that a few of them can use a presentation program PowerPoint (10% ) a very small number of the teachers know MS Excel (15%), just 25% of teachers can use Internet. An interesting fact is that 12% do not own computer skills at all which gives us the grounds for serious doubts. It is is still quite low in schools. moreover, in the inquiry of the city based school, where modern technologies should be well-developed, the use of electronic books is still very low. the The usage of e-books is shown in the circuit diagram in the following way: 32% of teachers use them, 68% of teachers are not able to adjust them to the subject of study. The study revealed that the number of school teachers who use information and communication technologies in the last 2 years, fivefold. 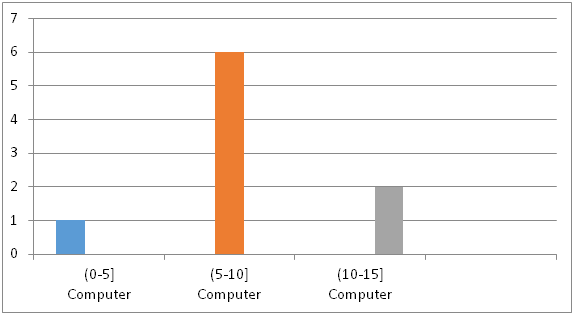 Teachers use computers successfully, but most of them (60%), including even those who have been specially trained still do not use computers or just use them very rarely. In Chapter IV Conclusions and recommendations are given. Thus, based on the research may suggest that less than half of the teachers are familiar with the modern technology and owns, manages text editor to work, much less work with tables and did not possess the smallest computer skills. However, a large part of the problem we have in the knowledge of presentation of the program, so they need to be retrained. (TPDC is conducting training course regularly , but there is problem because of lack of practice). the improvement of the educational process in secondary schools need to create a level of research institutions of IT methodological basis for the educational use of educational space. we should Use feedback from teachers on school websites with parents who keep in contact with the school. I have to engage them in their class on the website. Schools need to be involved to in the online conferences, which will allow us to search for information within the educational system by learning new technologies, in order to share experiences. we should take into account the new national educational technology standards-which places new demands on pupils / teachers. More attention is paid to the standard of students, assuring creative learning process, digital specifically. Successful life skills and attitude to developmental issues. Giunashvili g. ,, Modern technologies in school «, Journal ,, teacher» # 3, 2009. Labadze m. E-learning resources. Journal mastsavle¬beli. 2010. №5. P. 15-18. Makasarashvili months. Directions computerization of the education system. Publishing house «Merani». Tbilisi. 2007.
standard in information and communication technologies. National Education Plan 2011-2016. Видерхольд. Компьютер в начальной школе. Информатика и образование. 1993. №2. Mai Neo and Ken T. K. Neo, “Innovative teaching: Using multimedia in a problem-based learning environment”, Lecturers, Centre for Innovative Education (CINE) , Faculty of Creative Multimedia, kneo@pc.jaring.my. • The study consists of the following parts: the introduction, four chapters and references. • Introduction part begins with the fact that information and communication technologies are absolutely necessary for school education, which requires appropriate skilled teachers for using communication technolo-gies in order to solve the strategic task- high quality teaching. The 1st chapter discusses objectives, aims, methods, and certainty of the research. The research was done to determine the level of inclusion of information technologies into the teaching and learning processes, as well as to assess the outcome of it. What are the obstacles and possible solutions. Chapter II tells us about the methods used in research 1. The survey method - (questioning, internet tech-nology), 2. interviews, 3. observation of modernized lessons. Chapter III refers to the results of information technology inclusion. Conclusions and recommendations are given in Chapter IV. The study found that the number of teachers who use the information technology, the Internet in learning-teaching process, has increased, teaching quality is also significantly enhanced through including computer technology in teaching process, but it's still not enough, information technologies should be part of all subjects overcoming the difficulties of the process at the same time.